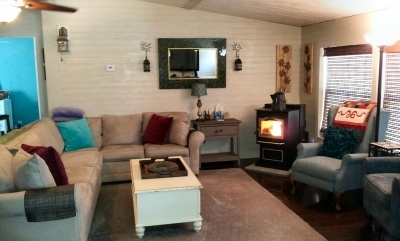 So, you checked out our post “Mobile Home Living Room Remodel- Episode 1, and you’re bugged that we didn’t include the final pics of the finished project in the first post, eh? Well, you’ve come to the right place! Instead of sharing these pics in a gallery right away, I’m just going to lay some of them out here in their beautiful glory and share my thoughts as I go. Shall we? I’ll include a gallery at the end. We covered the entire room with knotty pine tongue and groove panel. It came out beautifully, but it wasn’t easy! This project took us from January until May to complete working nearly every weekend give or take a few for R&R. 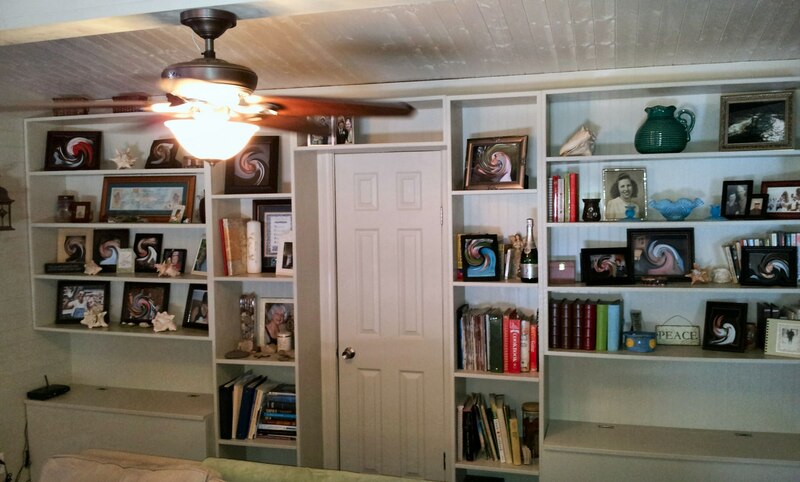 There wasn’t originally a light fixture in the center of the ceiling in this room. 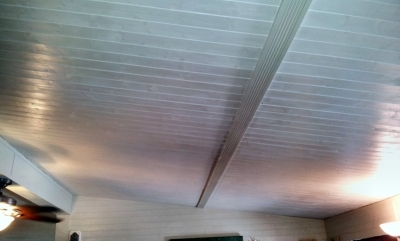 The beam in the center is where the two house sections come together and for many years we hard wired a cord into a ceiling fan/light and then mounted the cord along the ceiling and down the wall. It looked hideous even when it was covered with one of those wire cap thingy-ma-bobs. So, we took this opportunity to install real wiring and installing it all proper like. It looks terrific! 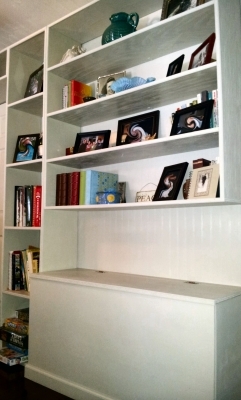 Our bookshelves and benches took several weekends to build, hang, sand, and paint. But, they were well worth it. These fantastic benches hold 16 bags of wood pellets! That means once every two weeks we have to walk outside and bring pellets in the house to feed the pellet stove. We didn’t even plan it that way. Originally, I just wanted a bunch of storage to fill with blankets, paper towels, beverage supplies, you know, all that crap you buy at Costco and don’t have anywhere to store. Anyhoo…one day after lugging in a few bags of pellets in -10* weather it occurred to me how lovely it would be to find another place for all that junk and store pellets in them. It was a pure stroke of genius, if I may say so myself. 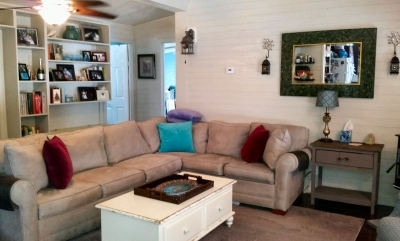 In our original post, Mobile Home Living Room Remodel- Episode 1, you will see a ridiculous little wall in the old living room in the gallery pictures. It was about 20 inches wide and just hung out in the middle of the room for no purpose. We took this opportunity to get rid of it and enjoy an open space there now. This was such a useless wall that there was no concern that it was load bearing at all. In fact, when tearing it out, it was barely attached to anything much less holding anything up! 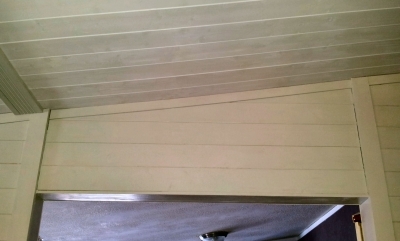 In the image above, the small wall once sat right at the end of where the bench is by the door. It looks so much nicer now! I will also speak highly about our choice of heating source in our home, which is a Harman Pellet Stove. Our stove is by far one of the best investments we have ever made for our home. It’s new this year and it’s absolutely beautiful! Lights itself, thermostat regulated, only needs cleaning once per ton burned…it is a blessing and a joy to have it in our home. I’ll close this post by saying that, while we have done a lot of projects, this may well be the most time consuming and exhausting project we have completed. We even put new floors in three rooms, wallpapered a bedroom, tore out a complete bathroom and restored in one shot before and that whole job wasn’t nearly as much work as this one was. It was just a lot of overhead work with our arms up in the air and lots of cutting and nailing and filling and painting. Don’t get me wrong, we LOVE this room. It is more than we could have ever hoped for. But if you take on a project like this, think it through very carefully to avoid mishaps and frustration. We worked in a circle and did it in sections that we thought through very carefully for cutting, trimming, working with weird angles and those nutzo problems you ALWAYS come across in a mobile home project. BUT! 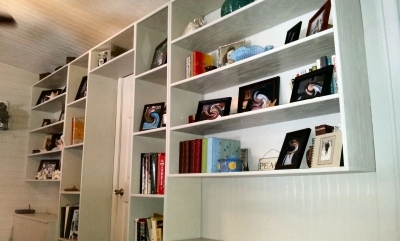 We were also able to alleviate some of the things that have always bugged us or that just didn’t get done quite the way we would have liked during another project in our living room, just by thinking things through and taking our time. 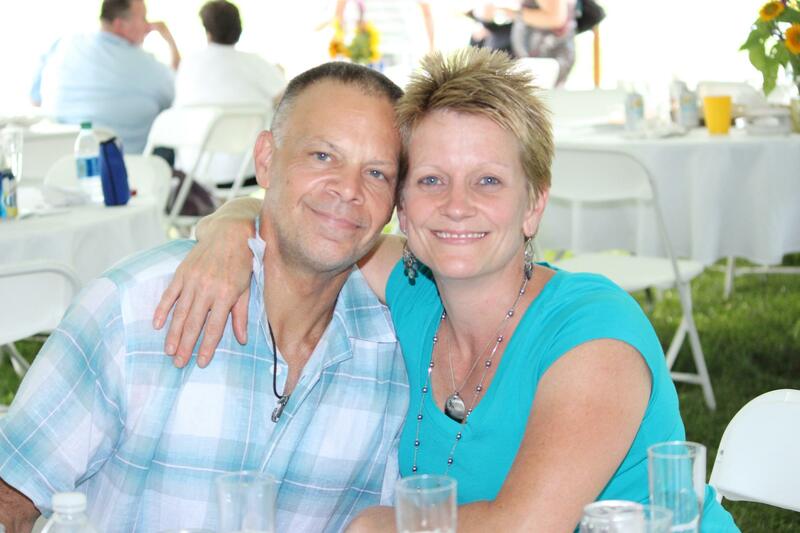 And…the best part…we are still married after it all! We hope you enjoy these photos and that they bring you some inspiration. This truly has made our mobile home feel like a stick-built cottage more than any other project you will find on this website. Thank you for visiting and we hope you enjoy the gallery of photos below. (You can see the images in full screen by clicking on the small “FS” in the bottom right corner of the gallery) Please leave a comment below and share your thoughts on our project and any other ideas you’d like to share. 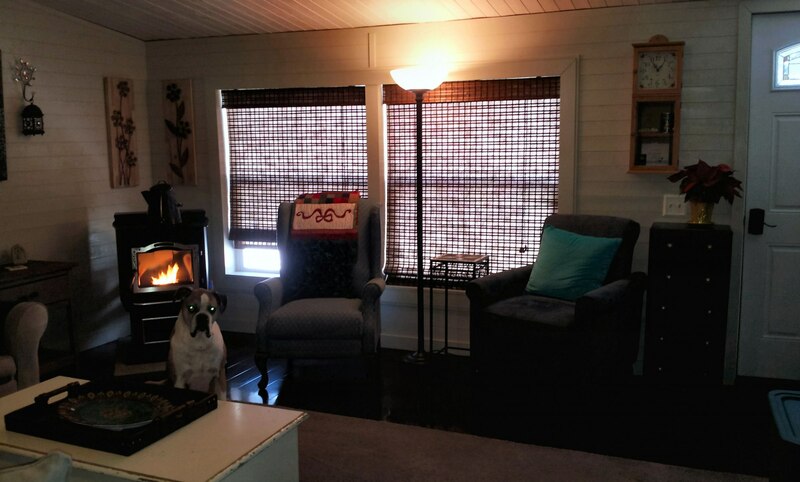 Our living room was recently remodeled using knotty pine tongue and groove paneling. Nice Work I am doing ours wall with ceder tongue and groove and the floor with oak tavern flooring trying to make it look like a Log Cabin. Oh Marvin! That sounds really lovely! What great choices. If you get a chance, please visit our facebook page at https://www.facebook.com/mobilehomemakeover/ and share some pics with us so we can all enjoy seeing your hard work. It really is an amazing remodel. I'm sure remodelling a mobile home has it's own set of challenges and this is testament to your work! Well done. I love what you've done to the living room, especially the plank walls and the ceilings. Our bedroom has damage to the ceiling and we are thinking of putting up pine also. Thank you for sharing! Hi Elizabeth. Thanks so much for visiting and commenting. 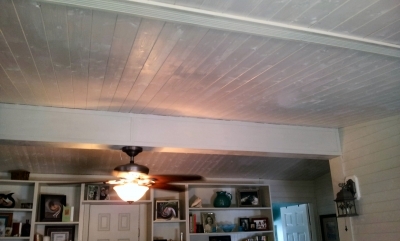 We LOVE LOVE LOVE the knotty pine. We are planning to open up two bedrooms to make a master suite this Spring and are hoping to use laminate on the walls instead. Laminate flooring planks, that is. Even if we don't do the whole thing, we will do an accent wall in this. We've wanted to try this for a long time since we have used a different laminate flooring in every room in the house and have a lot of experience with it. So, there's another option if you want to consider it. We've priced it out and depending upon what brand or style you use, you can do either the knotty pine or laminate for about 2$ per sq. foot. 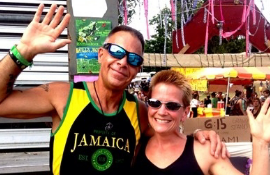 We'd love to see what you end up doing, so please feel free to come back and share or post pics on our facebook page. 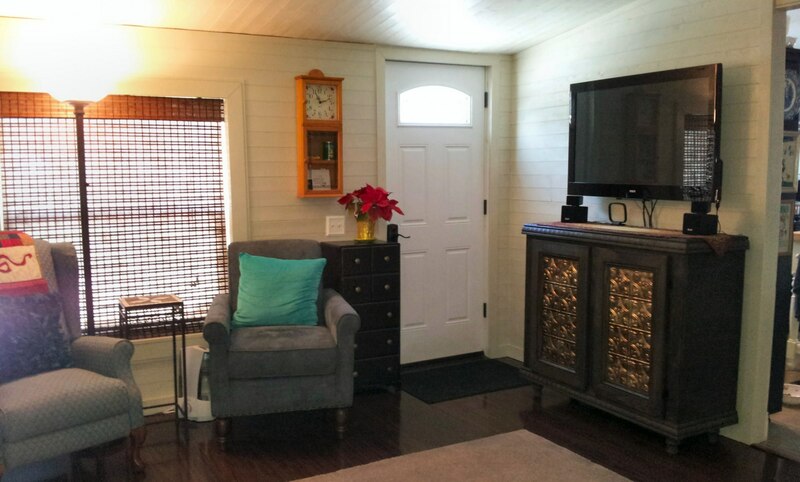 I had no idea a home remodeling project could look so great in a mobile home! Great work, love your blog! Sure! Thanks for visiting and commenting! 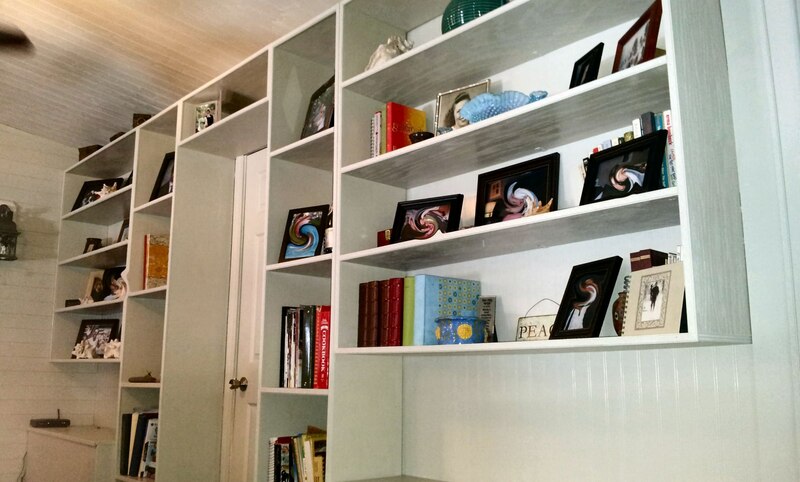 Love what you have done with your home! You have done an incredible job! What type of wood did you use for your ceiling and did you put the boards over the drywall. 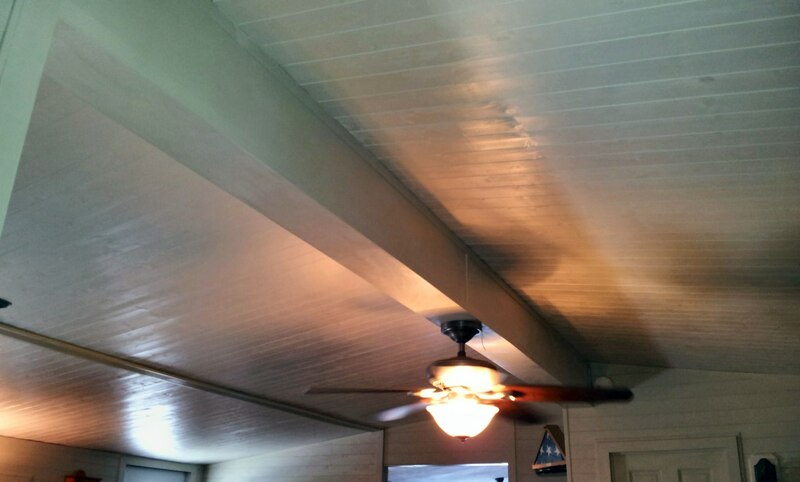 Did you use the same wood on the walls as your celing? I want to cover our popcorn celings but don't know how to do it. Any advice would be appreciated! Hi Allie. Thanks for visiting and commenting. 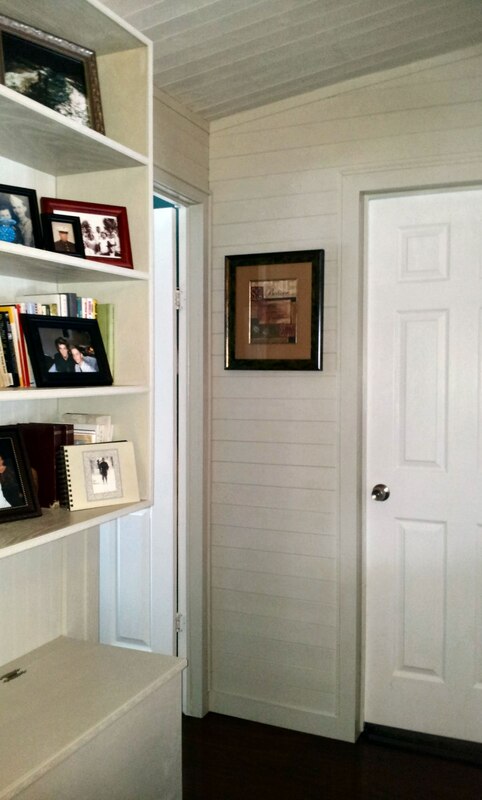 Our wall and ceiling surface of choice is knotty pine tongue and groove found at Lowe’s. It was pretty easy to install using a nail gun and applying Loctite builder's adhesive to the backsides. Yes, we applied it right over the wallboard. We did do a bit of a scrape down on the ceiling popcorn to smooth it out a bit before putting the pine up, but not too much. It was a big project that took several weekends to complete, but it's totally doable. We weren't discouraged enough by it to keep us from doing the same thing in another room. We plan to do the same in our bedroom sometime soon. Good luck to you and please visit our facebook page and share pics of your project when it gets underway. We'd love to see your work! 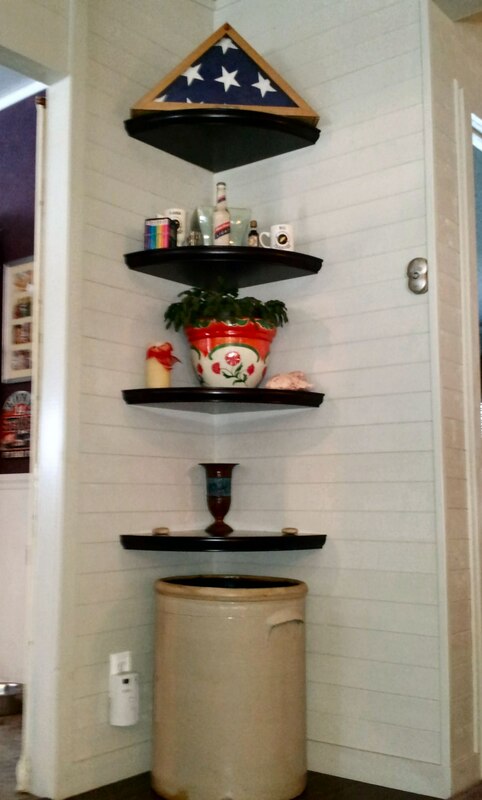 I love the idea on the knotty pine, I actually did my larger bathroom with it but of course I did it backwards. I had the panels going up and down instead of across. It looks good but the door and window frames/trim wasn't thick enough to cover over the ends. Anyway, I am going to try your knotty pine throughout the home and see how it looks. I have a wall to wall closet I tore down, any ideas on how to make a room bigger and the closet smaller? Great job. Wonderful pictures. Thanks for visiting and commenting, Patty. 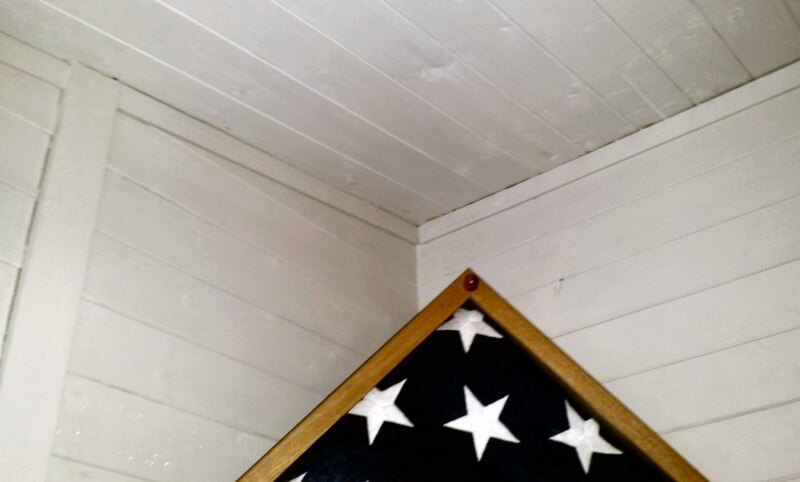 It sounds like you have good experience putting up the knotty pine and that's half the battle! We absolutely LOVE ours in our living room. I think it's the best change we've ever made to our home. As far as the closet goes, we built some closet organization just for our clothing needs and then created a work station for me in that space. It is open to the bedroom and makes it look so much bigger but part of the space still serves as a closet. Unfortunately, I haven't written the post with our bedroom remodel yet. Seems like I should…it was about 5 years ago :-)… you've inspired me to think about putting one together. If you sign up for email updates, you'll get an email when I post it! Check out the link on the front page of our blog. Thanks again and good luck with your knotty pine projects! Welcome, Cynthia, and thank you for commenting. 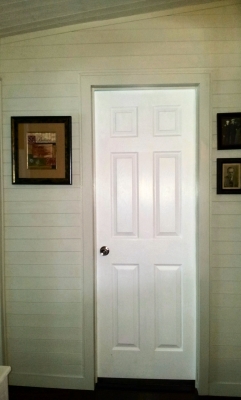 We really love our knotty pine and will likely use it in a couple more rooms. We love mobile homes too! It really is an amazing remodel. I'm sure remodeling a mobile home has it's own set of challenges. It's understandable that it took a while to complete but it sure looks worth it. I'll give you two thumbs up on your choice of the knotty pine walls, looks great. Thanks, Jack. We love the knotty pine! Thank you for visiting our site. 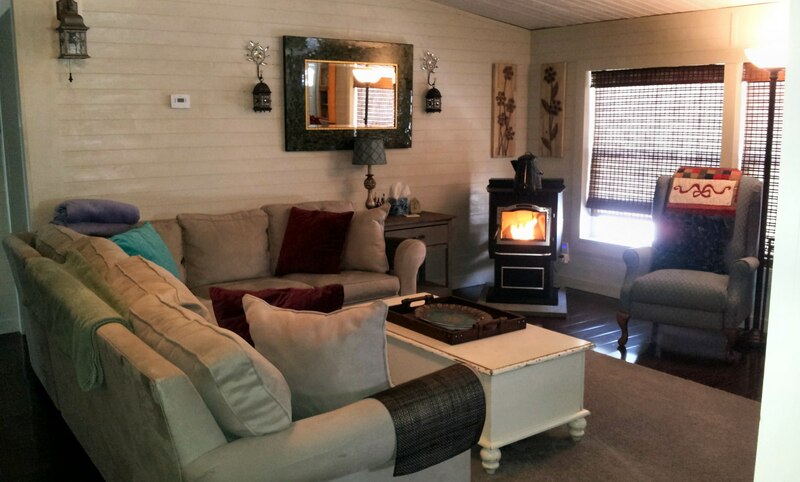 wow.. that makeover is amazing.. love the knotty pine on the walls. I live in a mobile home and am looking for some inspiration. Adding your's to my favorites. Thanks for visiting and commenting, Debbie! I'm so glad you liked the remodel. It was a bear to complete, but oh so worth it when it was done. I hope you come back and find more useful projects here. Good luck with your future projects and inspired designs! love the idea that you built a beam so you could run electrical wire though and hung the ceiling fun from it,brilliant. Thanks, John, for visiting and commenting. We love the way that beam turned out. We had been trying to figure out how to make that work for us for years. Very pretty, you did an excellent job. happy for you. Thanks, Marjie. And thank you for visiting our site and commenting! Great one. Thanks for sharing your experience with us. We live in a manufactured home since 05. It is in a park on a golf course. We love it here but do live amongst lots of older run down mobiles. We have completely remodeled our home. It started the day we moved in and we are still working at it. I am enjoying your blog. I also don't allow the "T" word around me. My home is very comfortable and easy to take care of. No house payment and reasonable property taxes makes us very happy. I have lots of pictures of our home in progress. Thanks for sharing your experience with us, Marjie. 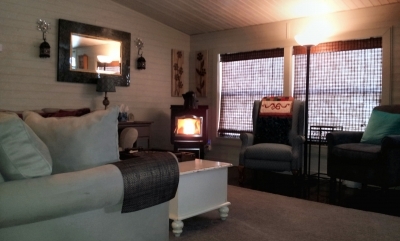 We're so glad you have found your bliss in your manufactured home! The benefits you mentioned really add to the quality of our lives for sure. If you like, please head over to our facebook page at https://www.facebook.com/mobilehomemakeover and share your pics. 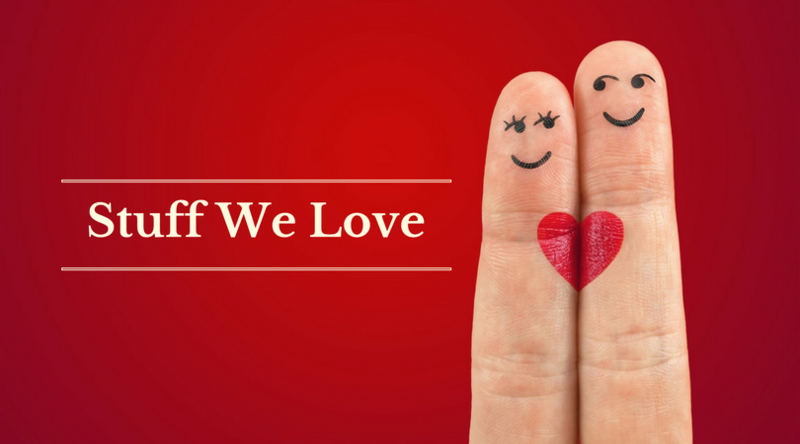 We love to see what other folks are doing! Well done!. You would never know you were in a mobile home. We also have a double wide, and when people come for the first time, they are so surprised that it looks like a "home" instead of a "trailer". That "T" word is not allowed around me.. ever !.. LOL I am sure the effort you put into beautifying your home was all worth it in the end. Again.. Well done !! Hi Sandy! Thank you for visiting and commenting. We really were relieved to have this huge project done. It took a long time and a lot of work but was totally worth it. I have often heard from people when they come into our double wide that they are shocked at what it looks like inside. They really don't expect it to look like it does! How nice you have the same experience! It really does make a difference. Thanks again and good luck on your future projects. Be sure to come back and check us out again. I hope to have a few new project posts up in the next couple of weeks. This is GORGEOUS! You guys never cease to amaze me and are such an inspiration to me (and many, many others). Thank you so much for sharing your beautiful home and helping us learn about the process and the get to see the end result! It motivates me like nothing else can. Congratulations – your hard work has paid off and you're ready for the cover of a magazine! Thanks so much for commenting and sharing the post on your facebook page. We really love this remodel and are thrilled to just sit in this space and call it home. It was a lot of work, but completely worth it. This blogging business takes a lot of time. Putting these posts together took forever and I still have about 5 projects we haven't even posted. I hope to get to them very soon!